Small LED lamp is ideal for dorms, home offices, and other compact spaces. 3-point adjustable arm and shade ensures smooth direction and height adjustments. Features convenient 3-diopter glass magnifier. 3.2W energy-saving light bulb included. Mounts easily on your desk or work table using the small black clamp at the base of the lamp. This is the best desk lamp ever! Especially when reading late at night and the print is small (college problems). The magnifier is such an incredible feature! Also super adjustable and great for late night study sessions. 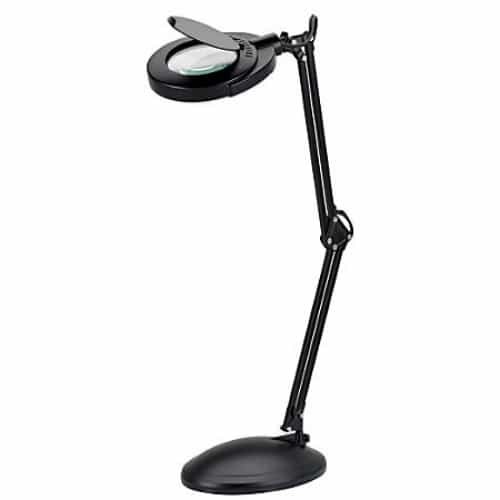 Ultra slim task lamp is the perfect fit for compact spacesBlack plastic base is slim and will occupy..
Elongated arm provides extended reachThis gooseneck task lamp has a flexible neck so you can focus t..
Classic clock with a simple styleRound wall clock features timeless contrast of black on white. Glas.. Whether you're studying for a midterm or putting the finishing touches on your big presentation, you..